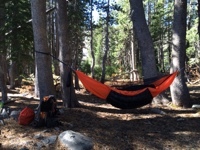 Oddball posts about backpacking, living in the mountains and traveling about. 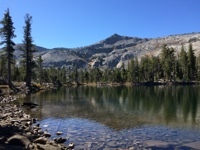 It's been many years since I've hiked in Desolation Wilderness, west of Lake Tahoe. Last time was when I hiked the Tahoe Rim Trail, probably ten years ago. It was summer then and there were lots of folks on the trail and camping alongside the many lakes in this area. Now? Haven't seen anyone at all. Nice. I originally thought I'd hike in here last night but it was too late by the time I got everything ready so I slept in my car at the trailhead and took off at first light. By the time I'd hiked the four miles into this lake I decided to do something very different for me and use this spot as a base camp, going out for day hikes and returning here to camp. The thing that decided me was the dang bear canister I got talked into borrowing from the ranger station when I went to pick up my permit yesterday. The loaner canister is a full three pounds and doesn't really fit well in my pack. I didn't realize the bears were so active this season or I could have brought my own (lighter) canister and a different pack. Suffice it to say, my pack was a tad uncomfortable. So here I am and I must say, it's actually kinda nice laying here in my hammock, mid morning, lazing about. I'm not used to this kind of backpacking, though I might be able to get used to it. We'll see how long I can tolerate the inaction. What did I forget? My version of toilet paper, and my standard packet of handiwipes. Well damn. I did have four squares of the blue shop towel I usually use but that's only two days for me, if I'm lucky. Today I was unlucky so now I'm down to two 4" by 4" squares. It looks like I may have to try out the natural material method many folks use. Some say using round, smooth rocks is good but I'm in granite country up here so I didn't find too many of those. I did find some sticks though and I was VERY careful to soften any potential pokey places on a rough stone. We will see how it goes - It's all an adventure.